What in the World Does FUBAR Mean? FUBAR certainly sounds like a word, but it isn't one. In fact, FUBAR is really a five-letter acronym used to represent a rather vulgar phrase. You can fill in those asterisks with what letters you know should be there to make an F-bomb. Although the last two letters A and R can be interchanged with other words, the overall meaning behind the phrase remains the same. People typically say something or somebody is "f***ed up" when they perceive it/them as having a bad or undesirable quality as if damaged in some way. This damage may be perceived in a physical, moral, theoretical or even philosophical sense. FUBAR is a military slang term that dates back long before the internet was ever around, having been used throughout the Second World War. Military personnel was known to use it informally to communicate when something was far too damaged to be able to recognize or repair it. 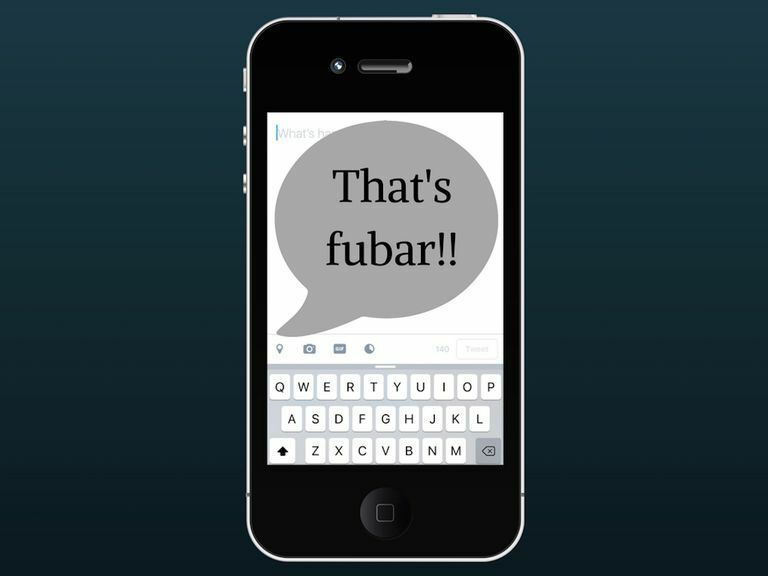 Although it has its roots in the military, FUBAR has evolved to become a convenient acronym to use in everyday life when texting or typing online. It gets the point across quickly without having to elaborate too much. People typically use FUBAR to describe anything they think is bad, wrong or simply not ideal. They could be talking about a relationship, the weather, a political event, a health condition, an internet trend or anything else under the sun. If anything goes against a person's desires or beliefs, FUBAR could technically be used to describe it from a personal perspective. Decided to try the new coffee shop on my block this morning but was disappointed to discover that their coffee is FUBAR. That game was so FUBAR for both teams that neither one deserves to advance to the playoffs. I can't believe I fried my laptop by spilling my smoothie all over it. FUBAR. FUBAR is not an acronym that has a place in every type of conversation. Here are a few general rules you might want to consider sticking to if you've considered adding this acronym to your online or texting vocabulary. You're not trying to impress anyone. Sorry, but this particular acronym isn't exactly going to make you sound intelligent and dignified. If you're just casually venting about something on social media or to a friend in a text and don't necessarily care about holding some type of reputation, you're probably fine to use FUBAR. You know others are okay with the F-bomb. FUBAR contains an F-bomb, so naturally, you should only use it when communicating with people who either use F-bombs themselves or have previously heard/seen you use them. A casual conversation with a close friend, for example, would probably be fine. You know others won't be confused by it. If the people you're texting or communicating with regularly use acronyms and other forms of online slang, they're more likely to know what FUBAR means compared to those who stick to proper spelling and grammar. FUBAR isn't the most popular acronym, so using it cause more confusion than understanding among people who aren't so well versed in online slang. You're having a serious conversation. Whether you're expressing your condolences to someone who lost a loved one or emailing an important message to your boss, the seriousness of a conversation's subject matter should be enough to convince you to refrain from using FUBAR. It's just not appropriate. You want to show respect (even in a casual conversation). Although FUBAR is best used in casual conversations, you may engage in casual conversations where you'll also want to seem respectful — and this is often best done by avoiding the use of any harsh language. For example, if you were messaging someone on an online dating site, you'd probably want to keep things casual and friendly, but show you respect them to improve your chances of getting them to like you. TIL? MRW? What do these acronyms mean? What Exactly Does 'Wowzers' Mean?